Bump mapping is one reason we cannot do the whole process in a single shader, you cannot generate a normal for a single point. 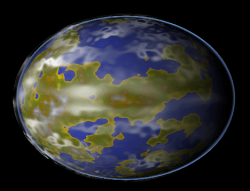 Actually creating a normal map for your planet from a height map is a trivial task. It is well documented all over the interweb so I can safely skim over it with little explanation. safex and safey just make sure that the same point is within the array by wrapping the coordinate around, look in the supplied source if you are not sure what I mean. 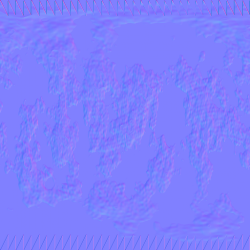 The normal map generated should look something like this. This is very harsh, big differences across the texture. Why? Well I have added a public variable Nz to the code. It is basically the size of your sample grid. By default this is zero, so you get very powerful variations in the bump map. This variable is very useful for controlling the strength of the bump mapping. It should be setup in the derived class, in this case WaterPlanet. Play around with different values but a value of 128 produces this result. Now we have to add bump mapping to our render code. The first thing to remember is that bump mapping requires tangents. Thankfully this is also trivial, in the content project click on your sphere model. Open the content processors sub panel in the properties window and turn 'generate tangent frames' to true. So now we need to make some changes to our shader. 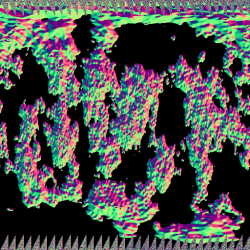 The vertex shader becomes this. We build a world to tangent space matrix use that to create our new light vector. Not going to tax the GPU much there. And viola! Bump mapped planet. Play around with Nz and see the effect it has on the render. That's it for part two, in the next page we start adding new planet types.